Hans Heysen first visited the Flinders Ranges in South Australia in 1926 and made numerous subsequent visits, producing a large number of drawings, watercolours and paintings of the area. 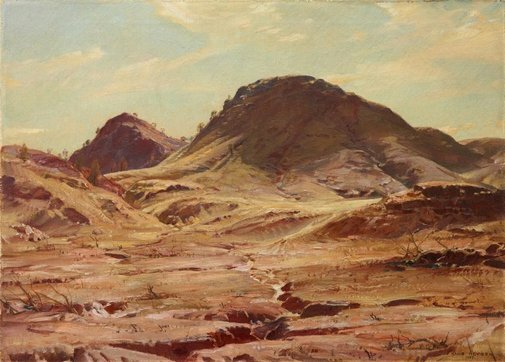 Drawn to the dry, ancient land, so different to the bush and beachscapes and lyrical pastoral scenes usually depicted by Australian landscape artists at the time, Heysen was one of the first non-Aboriginal artists to create and exhibit a significant body of works of the Australian desert interior. His well-promoted images of the outback with its intense red and ochre colours and austere geological formations helped to introduce new meanings of the Australian landscape to the public, most of whom had never seen the country’s interior. This work was a finalist in the 1929 Wynne Prize and was acquired by the Gallery in 1929. Signed and dated l.r. corner, brown oil "HANS HEYSEN/ 1929". Hendrik Kolenberg, Look , ‘Heysen to Heysen: letters across a generation’, pg. 33-36, Sydney, Mar 2012, 34 (colour illus. ), 35. Barry Pearce, Australian art: in the Art Gallery of New South Wales , 'Earth, sky and paint', pg. 149-150, Sydney, 2000, 153 (colour illus. ), 300. Geoffrey Smith, Sidney Nolan: desert & drought , 'Introduction', pg. 8-11, Melbourne, 2003, 10 (colour illus.). The Mercury , 'Loan pictures exhibition: three artists: Hans Heysen', pg. 6, Hobart, 19 Aug 1935, 6. Society of Artists Annual Exhibition (1929) , Sydney, 1929. cat.no. 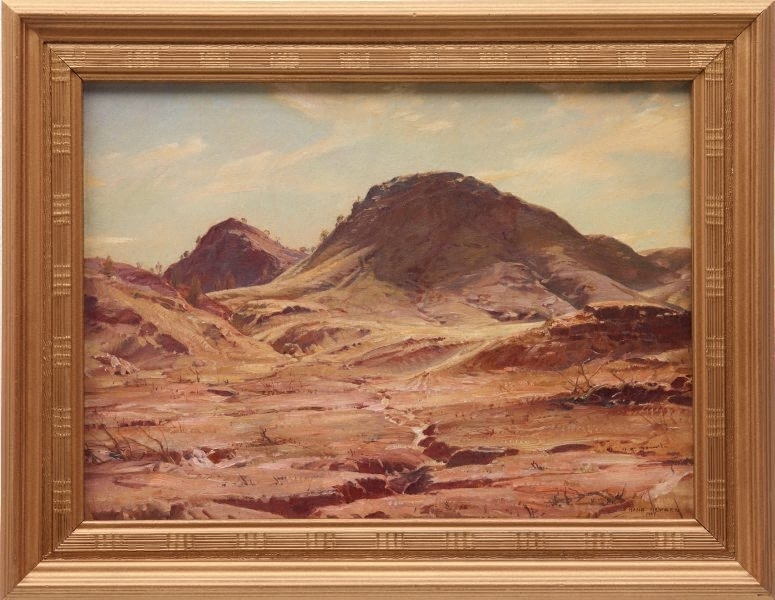 100; titled 'The Hill of the Creeping Shadow, Flinders Ranges'; priced 250 guineas. The Sydney morning herald , 'Society of Artists' exhibition at the Education Department', pg. 16, Sydney, 06 Sep 1929, 16 (illus). Arid Arcadia: Art of the Flinders Ranges , 'The bones of nature laid bare': Heysen's revelation', pg. 66-85, Adelaide, 2002, 77 (colour illus. ), 78, 187 (illus.). Hans Heysen , 'The Flinders Ranges: 'A deviation in Australian landscape painting'', pg. 88-115, Adelaide, 2008, 89 (colour illus. ), 133 (colour illus. ).